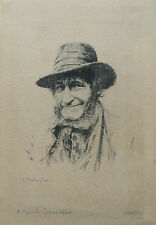 This 1894 photogravure print is titled " A Parish Councillor" and is by Alex Tallberg. It is signed in pencil in the lower left - A. Tallberg. The print has a small stain at the top left. The surrounding backing has glue marks where it was attached to a mat. High quality photographs were taken of the original works. The negatives were then exposed onto a gelatin covered copper plate, etched with acid, and printed in a similar fashion to an engraving. The importance of these was their faithfulness to the original and their ease of reproduction as no expensive handwork was involved. Photogravure from the 1887 first edition of John Muir's "Picturesque California". 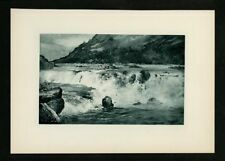 Original Photogravure found on page 160 titled "Falls Of Pitt River", by George Spiel. Condition: This image has not been retouched and shows the print in its current condition. Original photogravure found on page 156 titled "On The Bend (Shasta)", by W.C. Fitler. Photogravure from the 1887 first edition of John Muir's "Picturesque California". Condition: This image has not been retouched and shows the print in its current condition. 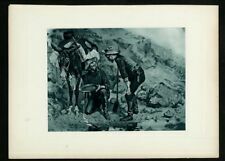 Original Photogravure found on page 236 titled "Miners Prospecting for Gold", by Frederick Remington. Photogravure from the 1887 first edition of John Muir's "Picturesque California". Condition: This image has not been retouched and shows the print in its current condition. Photogravure from the 1887 first edition of John Muir's "Picturesque California". 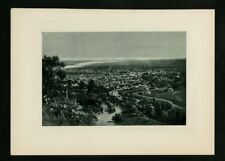 Original Photogravure found on page 128 titled "Los Angeles", by Thomas Hill. Condition: This image has not been retouched and shows the print in its current condition. Publ ished in 1893 by Balch Brothers, Boston. Henry Clay began building his Federal style. Henry Clay's original 672-acre estate once grew hemp, tobacco and grain. in Lexington, Kentucky. The Nature of Prints & Engravings : It was not until the 20th century that prints were commonly produced for the print itself. "A JAPANESE FANCY" PHOTOGRAVURE PRINT DEPICTING AN ORIENTAL MAN BLOWS SMOKE TEASING MONKEY IN AS FOUND CONDITION. IT HAS WEARS ON EDGES, MINOR STAINS ETC. Mount Vernon was the plantation house of George Washington, the first President of the United States, and his wife, Martha Dandridge Custis Washington. Built by Washington in 1758 to 1778. "Mount Vernon ". The Nature of Prints & Engravings : It was not until the 20th century that prints were commonly produced for the print itself. Prior to this, virtually all prints (and engravings) were produced as illustrations to be included in a manuscript, book, newspaper, or pamphlet. For Atlanta, a small city by comparison to other world's fair towns with only 75,000 population in 1895, it was an audacious undertaking. Smaller industrial fairs beneath the international scale had been previously held in the city, i.e. 1881 and 1887, so Atlanta knew how to mount an exposition. It is approx. a mile SE of Yorktown. It was built in the first part of the 1700s. Sitting in between Confederate lines in Yorktown and the Union forces on Wormley Creek, the house was within easy range of shell fire. Photogravure from the 1887 first edition of John Muir's "Picturesque California". Original photogravure found on page 212 titled "General View of Sitka", by Victor Perard. Condition: This image has not been retouched and shows the print in its current condition. New Orleans, Louisiana. Jackson Square, New Orleans ". Publ ished in 1893 by Balch Brothers, Boston. Jackson Square, for the battle's victorious General Jackson. In the center of the park stands a. Maker / country of origin : Gebbie & Hudson Co Ltd. / P. Nanteuil. Antique photogravure “The Old Woman And Her Two Servants”. Antique Print. Image is clear and no discolorations on print or matting. Monticello ". Monticello was the primary plantation of Thomas Jefferson, the third President of the United States, who began designing and building. Monticello at age 26 after inheriting land from his father. "Nero Persecuting the Christians". Publisher: Gebbie & Co., Philadelphia. 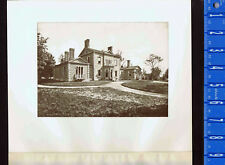 Original Antique Photogravure from late 1800s. Condition: Excellent. FREE Trial ! In 1803 the cornerstone was laid for the current City Hall, which was designed by Joseph Mangin and John McComb. When the building opened in 1812 many felt that it was too far north of the center of the City. Photogravure from the 1887 first edition of John Muir's "Picturesque California". Condition: This image has not been retouched and shows the print in its current condition. Overall good condition for its age. Photogravure from the 1887 first edition of John Muir's "Picturesque California". Original Photogravure found on page 228 titled "Logging in the Redwood Forest", by A. Hencke (. Condition: This image has not been retouched and shows the print in its current condition. ). Actual originals of Fiske's work are very rare because many of his negatives were burned in a house fire in 1904 and most of what were left were burned in a subsequent fire in 1943. The back of the print has what appears to be an original catalog number (last picture). Fort McHenry " c1890. It is best known for its role in the War of 1812, when it successfully defended Baltimore Harbor from an attack by the British navy from the Chesapeake Bay on September 13–14, 1814. Photogravure NIOBE c1889 by Solomon J Solomon. Rare Original. Approx Sheet size: 13" x 9.5" (330mm x 240mm) Blank to Verso. Original antique heliogravures from an 1890's book. Birthplace of Commodore O. H. Perry, South Kingston ". He was the son of United States Navy Captain Christopher Raymond Perry and of Sarah Wallace Alexander, and the older brother of Commodore Matthew C. Perry. Pineapple growing in Florida goes back to 1860, when Benjamin Baker planted the first pineapples in the Florida Keys at Plantation Key from plants he had brought in from Cuba. He had moved his plantation further inland, away from the coastal barrier islands as the bears along the beach enjoyed his pineapples too. Gravure Goupil et Cie.". The print is a photogravure. The image is titled " Falcon Chase in Algiers.". There is nothing printed on the reverse side. Photogravure PALLAS ATHENA & THE HERDSMANS DOGS c1889 from the picture by Riviere. Rare Original. Approx Sheet size: 13" x 9.5" (330mm x 240mm) Blank to Verso. Antique paper is delicate, and with photogravures, care must be taken to prevent the ink from being smudged. The original Bouguereau painting can be seen in the Musee des Beaux Arts, Mulhouse. The British Museum collection holds an identical copy of the photogravure here. Pair of 1878 Prints, Engraving of William-Adolphe Bouguereau (French, 1825-1905) Flora and Zephyr Oil Painting, Photogravure of Tony Robert-Fleury (French 1837-1911) Dr. Pinel at the Hospital of Salpetriere Oil on Canvas. Photogravure from the 1887 first edition of John Muir's "Picturesque California". Original Photogravure found on page 364 titled "Beach and Seal rock at Cliff-House", by C.D. Robinson. Condition: This image has not been retouched and shows the print in its current condition. Original photogravure found on page 196 titled "Mounts Fairweather and Crillon", by W.B. Styles. Photogravure from the 1887 first edition of John Muir's "Picturesque California". Condition: This image has not been retouched and shows the print in its current condition. Original photogravure found on page 168 titled "Squaw Valley, Near "Now-Ou-Wa", by Thomas Hill. Photogravure from the 1887 first edition of John Muir's "Picturesque California". Condition: This image has not been retouched and shows the print in its current condition. Photogravure from the 1887 first edition of John Muir's "Picturesque California". Original Photogravure found on page 260 titled "Early Morning Among The Tules", by Thomas Hill. Condition: This image has not been retouched and shows the print in its current condition. Rare 1887 New Jersey Coast Photogravure of William Trost Richards Seascape Oil on Canvas. Photogravure was one of the earliest photographic processes. 1888 Photogravure. The tissue guard covering the photogravure is included. Text isprinted on the tissue, not on the print itself. This is an ORIGINAL 1888 book plate, not a reproduction. The photogravure area is bright and clean and in excellent condition. Paper size: 17" by 11¾"; Plate size: 9¾" by 8". Photogravure from the 1887 first edition of John Muir's "Picturesque California". Original Photogravure found on page 120 titled "A Herd of Elk, Pitt River Canyon", by Thomas Hill. Condition: This image has not been retouched and shows the print in its current condition.